I had never been much for throwing stuffed animals or flowers on the ice. But, at 1997 Canadians, my friend wanted to get flowers and I went along. At the gift shop I found two hedgehogs, very small, and holding a little cloth rose in a front paw. I thought this was a nice combination of stuffed animal and flower and, anyway, it was TINY. One hedgehog fit in the palm of my hand. I decieded to get one for each of my favourite skaters at this event, Sebastien and Jayson. I didn't think too carefully because I was sitting in the middle of a row and it was a long series of tactical manoeuvres to find a free seat on an aisle at the right time. Thank heavans they were in the same group for the short program or I never would have made it. Well, having crossed this bridge in my skating fandom, I should have known it was not over. I went to Skate America with no intentions of stuffed animals or flowers. "Well," I said to everyone, "if there is a REALLY cute stuffed animal, I will get it." I looked half-heartedly (what else is there to do in the thrilling Renaissance Center?) and wasn't planning on much and then, I was just buying some Tic Tacs, honestly, and there it was. Sitting on the counter, all by his lonesome, away from all the other stuffed animals. The hedgehog. THE SAME HEDGEHOG, just a large verison. The rose and all. Well, this was clearly a sign. How could I ignore it? I couldn't. A few hours later, the hedgehog was ready to meet the ice at Joe Louis. My seat was right near the Kiss and Cry and I managed to toss the hedgehog just as Jayson was skating past. He picked it up, looked up in the stands, and I waved my Canadian flag and he said "Thank you very much". 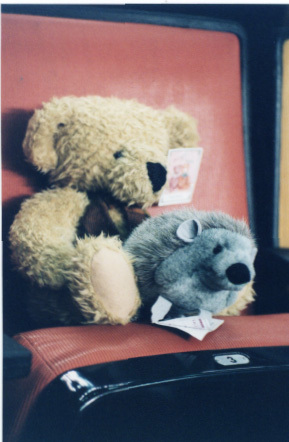 So, this is a picture of the hedgehog I threw at Canadians this year. It's not the same but that hedgehog market is small and I seem to be getting every single one. Keep your eye out for the hedgehog from now on. How can I not throw one?